NORTHRIDGE, Calif. - Sept. 26, 2018 -- The group is Rhythm Tribe and their family has been playing music for 4 generations. Starting with Rafael "Fello" Sanchez in 1915, a legendary Cuartista and Guitarist from Corozal, P.R.. His son, Rafael Guzman-Sanchez, also from Corozal P.R., began his career as a professional guitarist in 1941. He performed on radio throughout the 50's and innovated a new rhythmic technique for Guaracha music. Thomas Guzman-Sanchez is the 3rd generation of professional guitarist/musician in the family and the founder of Rhythm Tribe (Zoo/BMG 1989-94, VRL Muzic 1995). He is now joined by his children Mason Guzman-Sanchez, age 22, guitarist, and Brisa Guzman-Sanchez, age 20, with her R&B stylized vocals. Together they represent a new generation of familial musicians. Thomas was inspired to reach out to his kids to see if they wanted to do a musical project together. After saying yes, the trio started a new incarnation of Rhythm Tribe (which has not released a recording in 23 years). Thomas enlisted the rhythmic mastery from the great Esau Garcia, a musical veteran who has innovated a new hybrid concept of drums/percussion. It is this collective that has made a new album possible. Together, they've called the album "Generations." These four comprise a fresh, new line-up of a group that has garnered international acclaim for their energetic and innovative take on modern Latin music: Dave Marsh (legendary writer - Rolling Stone) wrote in 1990, "Rhythm Tribe is the greatest Latin hybrid since Santana." Now that radio stations across the USA are playing mainstream hits with Spanish lyrics, from pop to rap, the industry has evolved to reflect this change. Rhythm Tribe's new "Acid Latin" sound takes them to a place never traveled. Since 2017 they have been working together writing new songs that pull from many influences. A raw Pop, Rock, R&B and Latin fusion that comes from the heart. The sound is simple; two Flamenco guitars, hybrid drums/percussion and soaring vocals. The group actually recorded 10 songs in 2 days and were able to capture that organic essence that can only happen when musicians click. The new "Generations" project was recorded at NRG Studios, North Hollywood, CA, engineered by Kyle Hoffmann and mastered by Howie Weinberg. Six songs were filmed at EVS in Burbank and have been produced into separate music videos/mini documentaries. The first release, "You Can't Take Me Down", features the group in live performance with historical images from four generations of musicians. 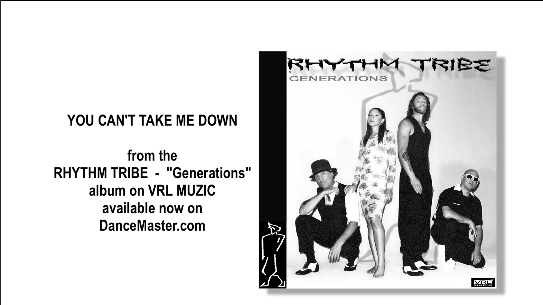 Their musical mastery and Acid Latin approach take this Rhythm Tribe to a new level in rhythm and the next level in music.